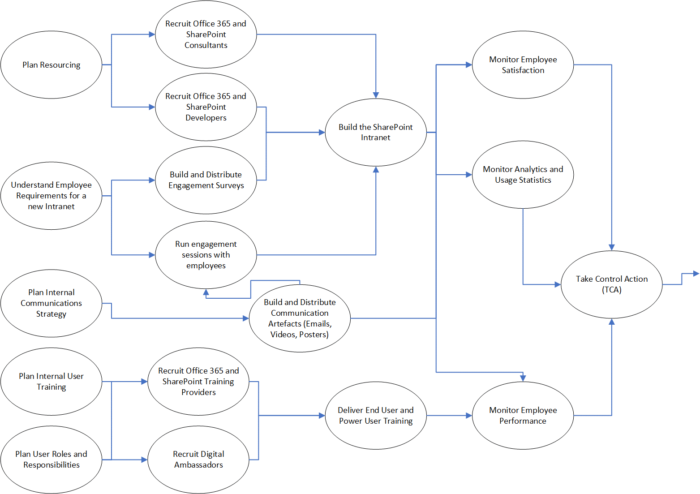 After the recent attendance (and passing) of a British Computing Society (BCS) accredited course in Business Analysis Practice, I have made the decision to relate the lessons that I have learnt with my core job role; a Senior Office 365 and SharePoint Consultant. The facilitation of an effective brainstorming session is critical to generate a number of ideas for further discussion when working on a change in an organisation, like that of Digital Transformation. Brainstorming can bring together a multitude of individuals to discuss ideas about the organisation. Ideas like how they can communicate better, automate processes and collaborate with one another to make a more efficient workplace. The most important rule of brainstorming is that there is no wrong answer, and no challenges should be made. All members of a brainstorming session must feel as if they have been invited to throw ideas up onto a board for the time being – these will then be reviewed and evaluated at a later date before being streamlined into phases of a project. Brainstorming sessions can be achieved by asking each person for an idea individually and having these written onto a board. However, if your organisation is unlikely to want to verbalise ideas then the use of post-it notes can make it easier for ideas to be collated. Although, each item should still contain the participant’s name and department as the project may warrant further discussion with them and their team at a later date. Ideas should also be kept visible for all participants, to allow them to be expanded with further suggestions. The benefit of brainstorming is to understand a great variety of ideas from across the business. Digital Transformation should provide value to all employees and it is impossible for IT or Marketing to recognise all the ways in which this could be achieved without input. 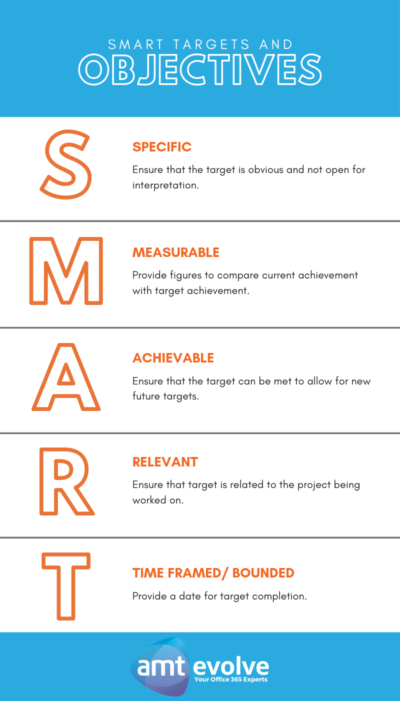 In the examples below I have generated some standard targets, and have then transformed them into SMART Targets. As you can see, the SMART Targets are not too much longer or more detailed. But, they have an extra amount of information that will benefit in future review. This type of target will also assist when discussing Digital Transformation projects with senior members of staff. This is because it can easily outline the reason behind the need for change. Reduction in Silo Working from 80% of the organisation to 20% of the organisation within the next 2 years. Increase the usage of Microsoft Teams for Internal Communication, ensuring that over 50% of the organisation are using it within the next 12 months. Achieve a score stating that 90% of the organisation “Strongly Agree” that Internal Communications is delivered in an efficient and effective manner by the 2019 Employee Satisfaction Survey. I will admit that a Rich Picture Diagram was not a tool that I had come across before. However, I do believe it is useful to have within the toolkit and can assist in Digital Transformation Projects. A Rich Picture Diagram is simply a picture that is drawn to showcase the current situation within the organisation. This can be developed in any way that suits the BA or Consultant as there is not a set format. Therefore, you will see a multitude of Rich Picture types from stick men, to cartoons to photos, that illustrate business. It is common knowledge that “a picture says a thousand words” so the use of this tool allows for easy demonstration and explanation, to project stakeholders, of the current situation. It can lead on to why the business change is required and beneficial. 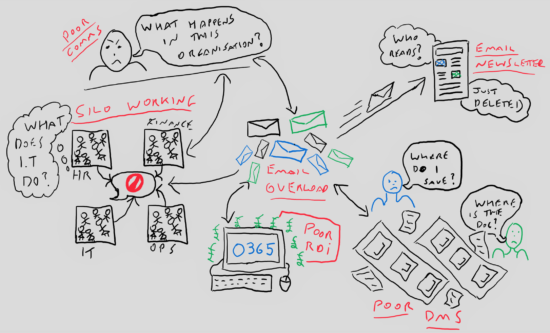 The following image is an example Rich Picture Diagram put together via Microsoft Whiteboard. It illustrates a business showcasing common problems that are resolved by Digital Transformation. A Business Change Project can be planned via the use of a Business Activity Model (BAM), like the one displayed below. Planning – Understand requirements or generate a plan for a specific activity. Enabling – Ensure that a plan can progress into a Doing activity e,g. purchasing a tool. Doing – Complete the actual work that is required. Monitoring – Review, report and analyse changes, as well as the outputs from updated systems. Controlling – Make changes to any activity in the diagram as time passes and systems update. A BAM will utilise arrows that showcase dependencies. Therefore, the item at the start of an arrow needs to be complete before the continuation of the next activity. For example, Training cannot be provided until a Training Provider has been booked. Multiple dependencies may be in place for specific activities. A unique lightning strike arrow is placed after the control activities. This symbolises that the output of the control could feed into any areas of the model. Showcasing this with additional arrows would make the diagram complex and potentially unreadable, which is why this symbol is used. BAM should not be mistaken for a process, these will be developed a lot later for each activity as required. However, to begin with, a BAM allows for all relevant activities to be placed into a diagram. This is to ensure that there is a clear understanding of all the variety of stages that need to happen to allow for the successful delivery of a project. The below example is based on a simple set of activities to assist in an Office 365 and SharePoint Project. As a quick tip, multiple Control Activities can be placed after the Monitoring Activities. However, feeding all the items into a “Take Control Action” (“TCA”) will easily showcase that the outputs of all the monitors will lead to additional control inputting into other activities. Many personnel wrongly believe that Project Stakeholders are only those responsible for the project and have a defined ownership level. However, a Project Stakeholder is really the term given to any person, which have an influence on the generated change. This is crucial when working on Digital Transformation. The entirety of the organisation is being asked to change the way they work, and change their culture. The change is occurring to provide a large number of benefits for the users, however, this will be difficult for them to see and notice from the first few iterations of the project deliverables. Changes to internal systems and processes may also impact the way that suppliers, partners and customers/clients are interacted with – this is an example of external influences on the project and is why they need to be considered as a stakeholder. Understanding the attitudes of all your stakeholders, the impact they may have on the project and the way they should be managed is critical for the successful implementation of Digital Transformation. Accommodator (Low Benefit, Low Change) – these are users who are not impacted throughout the project. Therefore, you need to be aware of any changes in their circumstances, but, will not need to manage their expectations to dramatically. Collaborator (High Benefit, Low Change) – these are users who will “win” if the project is a success, but, will not need to change the way they work too much. This means that these users will continue to work in a similar way, but more efficiently. It is these users who should work with you on the project and should be utilised as a voice to back the project, perfect for a Digital Ambassador/Champion. Compromiser (High Benefit, High Change) – These are users who have to change the way they work, but, as they will benefit from it greatly then the impact to them should be mitigated. Although these users may work with you, they need to be managed carefully as they will have a high expectation to get the changes implemented quickly. Once again these stakeholders could act as Digital Ambassadors or Champions. 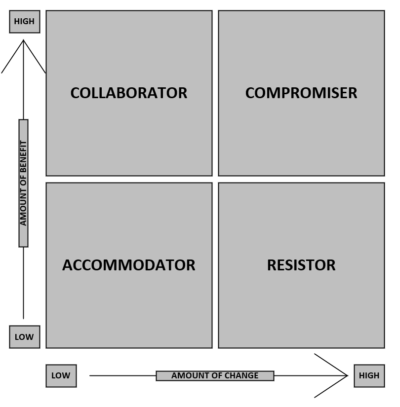 Resistor (Low Benefit, High Change) – These are users who will have to change the way they work, but, will not receive any (or as much) of the benefit personally. As the users will not be benefiting from the project there will be a focus on the amount of change required (and no one likes change!) which is why the stakeholders will likely resist from helping progress the project. The best course of management here is to provide a relevant reason for the stakeholders to engage, potentially through providing another set of benefits e.g. additional holiday days, promotions etc… It is beneficial to get these users on your side, to avoid any difficult issues, such as disciplinary’s or reorganisations. Least Important (Low Influence, Low Interest) – These users are not really applicable to the project, as they do not show an interest in its success, which is likely due to not impacting on their department and/or work. These users also do not become a threat as they are unable to influence the way in which the project is delivered. Meet their Needs (High Influence, Low Interest) – These users are not going to readily back your Digital Transformation Project due to their limited interest in it, although they could become a project risk due to the level of influence on the project they have. Stakeholders within this quadrant need to have their needs and expectations managed, which will ensure that they either influence the project for the good or at least do not influence the project in a negative way. 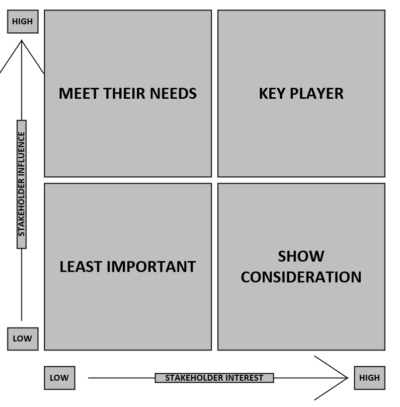 Key Player (High Influence, High Interest) – The most important quadrant that can be utilised (although all must be managed) is the Key players. This is due to their interest in working with the project and ensuring it is a success, as well as having a strong influential position to help push the project forward and change stakeholder perspectives as required. Show Consideration (High Interest, Low Influence) – The users with a high interest in the project will prove beneficial, due to being supportive. However, they are not a group to be relied upon heavily to help complete a project successfully as they do not have a high enough level of influence to push their interest on to others. Although these users may not assist the project directly, they do improve project mentality; as it is good to work in an environment that is supportive and understand that there are stakeholders who appreciate the work you are delivering. Holding on to these users can build morale within the project team. The review of stakeholders will also assist in understanding the best techniques to work with the individuals when gathering requirements. As an example Interview Techniques would be used for stakeholders who have an interest in sharing their thoughts and knowledge, and are willing to provide their time to answer questions. Whereas, users who are against this may provide better information through the use of Observation Techniques as all that is expected of these users are for them to continue their standard day-to-day proceedings in the workplace. The Business Analysis techniques and Soft Systems Methodologies that I have learnt are relevant to a full range of projects, with Digital Transformation being no different. As a consultant I find myself performing a number of BA activities, sometimes unaware of it. Ensuring that a large project, which changes the way your organisation works, is managed is paramount for successful outputs. Therefore, I hope sharing these techniques, with a SharePoint and Office 365 perspective will prove useful. Please get in touch if you wish to learn more about SharePoint, Document Management Systems, Metadata and Intranets, or utilise our skills in leading a successful Digital Transformation Project for your organisation. With thanks to. . .
*Debra Paul. James Cadle. Donald Yeates. 2017 (2014). Business Analysis. 3rd ed. Swindon: British Computer Society, pp.12 & 115. 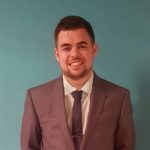 This article was written by our Senior SharePoint Consultant, Steve Glasspool.